Cape Town - The Proteas’ new-found ruthlessness has just been confirmed in the New Year Test at Newlands. Split as they have been by a few weeks, it may have escaped the notice of some critics that South Africa have finally achieved something they’d battled to do in five or more previous years - win successive high-profile Tests by genuinely crushing margins. They are not at all unaccustomed to rousing victories, of course, but they have inexplicably, so seldom before managed to produce them in back-to-back matches, whether in one particular series or straddling two. Friday’s trouncing of New Zealand by an innings and 27 runs, not long after the scheduled midway point of the contest, comes on the heels of their series-deciding, rollicking 309-run win against Australia in Perth. It does seem that a killer streak is developing into a more sustained, killer touch. South Africa are learning not just to toy with fallen prey before retreating a little apologetically back into the long grass; they can strip the carcass these days. Say what you like about the low-ranked Black Caps, under-strength and dogged by camp upheaval: not much more than a year ago, fielding seven of the same troops so out-muscled at Newlands, they shared a similar, two-Test series in Australia after upsetting their hosts in a Hobart thriller. They have their clear limitations, yes, but they are also not some sort of motley pub team. It was always likely that they would produce infinitely better resistance in their second turn at the crease after that horrific, 19-over first. Maiden century-maker Dean Brownlie, captain Brendon McCullum and BJ Watling, in particular, at least offered evidence of trademark Kiwi grit - something to bank amidst the present poverty and uncertainty for the second Test at St George’s Park from Friday. Yet even as the New Zealand backbone stiffened, South Africa’s bowlers - unlike on day two, when they lost the plot at times - plugged away with both urgency and menace. The arrows kept flying from Dale Steyn, Vernon Philander, Morne Morkel and even the remarkable Jacques Kallis, who is still not unwilling to tickle ribcages and get batsmen weaving whether it is with a notably old or gleaming new ball. This refusal to ease pressure meant that by the time the tourists’ tail was finally ready to be exposed, the occupants of slots eight to 11 did not, for the most part, have the stomach for any significant further fight. 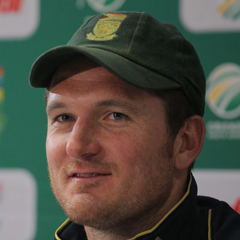 “Everyone will have a different theory on mental toughness and what’s important about it,” South Africa’s visibly elated captain Graeme Smith said at the post-match press conference. “It’s ingrained in us now that we’ve come through a lot of tough situations, around the world. Just as quickly, he qualified his statement by saying that he did not mean his side had become a bunch of “Camel Trophy-type” (jocks). Was the performance indeed evidence of a new remorselessness? “I think so. It’s just about winning at the end of the day, what you’re defined on. There’s a good degree of confidence in the squad that enables you to play that way. “If as a team you’ve come off (many) good wins it’s a lot easier to play in that manner. We’d love to build on the momentum we created in 2012, and this is a perfect way to start our summer at home. “Our intensity was great from the start of the match; we asked questions early on. There was one little spell yesterday (Thursday) after tea where we got a little loose but overall this was a very good bowling performance. At the same time, he significantly also cautioned against a return to the old bogey of complacency for the Port Elizabeth follow-up. “You’ve got to keep yourself on your toes. Sport is unpredictable ... the other day QPR beat Chelsea in the Premiership; I wasn’t expecting that. Signs are that that will be the case.